In November 2015 Sony released The Bootleg Series Vol.12: The Cutting Edge 1965-1966, designed to give a new insight into Dylan's creative process in these two remarkable years while also protecting Sony's copyright on the previously unreleased material of this time. The retail 2-CD and 6-CD editions gave you selections that could always be quibbled with; really the only logical approach was to listen through the whole process for each song via the mail-order-only 18-CD Collector's Edition. This enormous limited edition contained practically all the music Dylan recorded in those two years - every take of every song from his Columbia sessions in New York and Nashville, arranged in chronological sequence. It seemed a shame that the production eliminated much of the between-takes chat (and possibly some recorded rehearsals); and at $599 plus delivery charges the cost was quite unprecedented, particularly if you lived outside the USA; but nonetheless this was a dream come true for 5,000 Dylan fans. The music was remixed in fly-on-the-wall fashion by Steve Addabbo, without any post-production gloss: narrow stereo, with little or no added reverb or other effects. The mixed recordings were then mastered for CD by Mark Wilder, who had performed the same service a few years previously for The Original Mono Recordings. 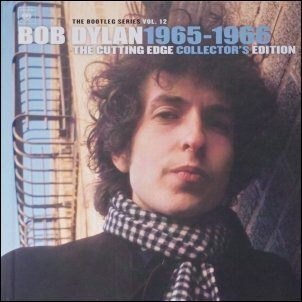 The complete 1965-66 sessions as presented on the 18-CD edition of The Cutting Edge quite correctly included the master takes selected for release on Dylan's albums and singles of this period, but treated in exactly the same way, as raw session material rather than as finished mixes ready for release. These unpolished mixes sometimes shed light on details of the final, released versions, so I have where appropriate included comments in the discussions of the three albums. For those who might be interested (principally those who bought the 18-CD box, I'd imagine), I am providing links here to a series of six articles written for the UK Dylan fanzine ISIS, giving a detailed commentary on these complete studio sessions. I have made a few updates since they were originally published, and for the benefit of those who have already read the articles in print, I have inserted the updates as comments (which can easily be found) rather than burying them in a revised text. Note: In order to see these comments properly you will probably need to download the pdf files and open them with Acrobat Reader; Acrobat browser plugins don't generally display comments well. I have recently added a number of notes in the light of facts learned or issues raised by Daryl Sanders' excellent book That Thin, Wild Mercury Sound: Dylan, Nashville and the Making of Blonde on Blonde (Chicago Review Press, October 2018). Daryl has passed on further information through his participation in an online discussion about his book on the Steve Hoffman Music Forums. These updates to the PDF files can be found in Parts 2, 4, 5 & 6 and can be identified by a new style of sticky note symbol. Don't forget you'll need to download the PDF files again in order to read the sticky notes properly, and you may find you have to update Acrobat Reader to the latest version.